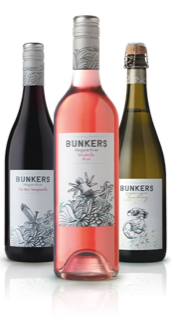 Bunkers Wines is named after spectacular Bunker Bay, the pristine beauty on the tip of the Cape Naturaliste peninsula in the Margaret River wine region in Western Australia. Bunkers brings together surfing and wine, two of the region’s greatest passions. Lefthanders, Supertubes, Honeycombs, Windmills, Guillotines, Bears and The Box make up the Bunkers range – each wine is a reflection of its namesake Margaret River surf break. From a zippy Sauvignon Blanc Semillon through to a deep, rich Tempranillo, there is something to suit every taste. These are serious wines… for not so serious people. Bunkers wines are a world away from your average bottle.